Here's another design idea from the unfilmed fourth live-action movie. 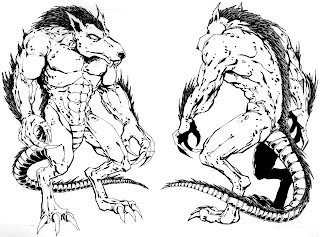 We wanted to give Splinter a much more active part in the battles that the Turtles fought, and so he was going to have the ability to morph into a big, lithe, muscular “super rat mutant” type of thing. -->> ..again, the illustration alone renders awesome. Wonder how much ( if at all )this inspired Sliver. Sliver was rather muscular, at least in the cartoon and Video Game. I think the concept of continued mutagen effects is really cool actually, I think the unfortunate part is that after the events of TMNT 3 and the time this movie would have seen release it probably would have been largely overlooked, which is why it is probably fortunate the film didn't materialize. With that said, I think the designs are really neat and could have been something cool. I would still love to see something like this implemented in a new live action film, but I understand why that isn't likely to happen nowadays. Maybe something similar could be done that would only effect one turtle, and the plot could revolve around what it would take to fix the issue for them, where they need more ooze as an antidote but there is only one vile left ala: Secret of the Ooze. I do like the design. I'm just glad you didn't go there. It somehow doesn't feel "Turtles" to me. Well, it's an awesome drawing even if the "next mutation" concept didn't develop into a film. Actually what this brings to mind is something like a were-rat, which while maybe not strong enough to carry a whole movie might make for a fun comic book story arc. And unlike *some* of my friends here I am more than happy to ignore Image's bat-rat Splinter incident. Oh, wow... I'm eternally grateful that this didn't happen. Very cool drawing, though. I'm actually really glad that the Turtles didn't end up getting superpowers and stuff. Changing how they dress is fine by me, though. I don't mind some of the other stuff that went on in Image or what's going on in your book right now, though, because I'm pretty sure that things'll likely be set straight before it's all over. Don can't be an action figure forever. I don't think this is lame at all, I was a bit dissapointed that this didn't happen to splinter in the old cartoon when they kept talking about him changing along with the turtles and nothing happend. I like the Super Turtles. One thing makes me a little upset to Playmates. No Super Turtles , yet. Maybe in time..maybe NECA ..
NECA hasn't even gotten back about the single releases of the B&W TMNT, April, Shredder, or the Foot Soldier so let's get that out of the way before some Super Turtles get made. So since there hasn't been any news from NECA in some time can you please shead some light on what's going on with them PETER?? It seems as if no one knows what's up with them not even people at Mirage. "NECA hasn't even gotten back about the single releases of the B&W TMNT, April, Shredder, or the Foot Soldier..."
NECA's website was down for over a month, I was dreading the worst... It's back now, but there's been no news updates on any of their products since early September. Yeah I don't know what is up with them but their site was down before and then came back and then went down last week again was it? but now it's back up with no new updates, very odd. And I've noticed they seem to be releasing one figure a month now or something.